​Can football resolve the feud between Qatar, the UAE and Saudi Arabia? Can football resolve the feud between Qatar, the UAE and Saudi Arabia? The ongoing dispute between Gulf neighbours Qatar, the UAE and Saudi Arabia (with a variety of other countries allied to one side or the other), has become increasingly disruptive and dangerous; even victimising disinterested foreign visitors to the Gulf as the rivals ramp up pressure tactics against each other. 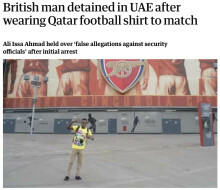 Just last month a British national was attacked and subsequently jailed in the UAE for wearing a team jersey for the Qatar national football team while attending a match of the Asian Cup. Earlier, Matthew Hedges, another Briton, was accused by the UAE of being a spy, ostensibly because of his perceived Qatari connections, while doing research in the Emirates for his PhD. 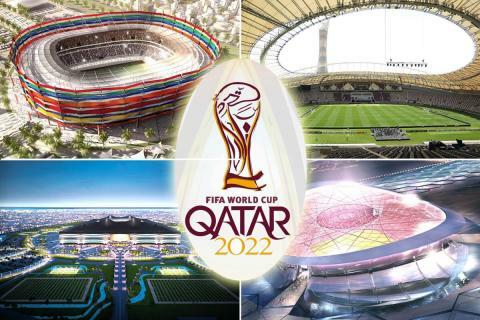 The conflict has been going on for quite some time, but some speculate that Qatar’s successful bid to host the 2022 World Cup could be a major factor in the regional feud. UAE security chief Dhahi Khalfan tweeted all the way back in 2017 "If Qatar no longer hosts the World Cup, the crisis will go from Qatar because the crisis was created to end it". 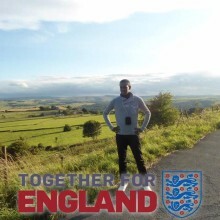 It has been suggested that football caused the crisis between the Gulf nations, and football may be the only thing that can resolve it. FIFA is expected to decide next month whether or not to expand the number of teams involved in the Cup from 32 to 48 teams, and has indicated that Qatar may be too small to accommodate the event. This has raised the possibility that Qatar’s neighbours, like the UAE, may be able to share in hosting the World Cup; something the Emirates has already volunteered to do. Emirati sports official Aref al-Awani, said in January that his country "would be willing to provide any help needed” if FIFA proposed a joint-hosting scenario. The World Cup is more than a sporting event, it is an economic event worth billions of dollars to whoever hosts it. Saudi Arabia and the UAE have increasingly signalled that they will do their utmost to undermine Qatar’s hosting in 2022, even hiring a UK lobbying firm to implement a comprehensive campaign to sabotage the event. FIFA was likely oblivious to the rancor their decision would create when they selected Qatar to host the Cup; but it should come as no great surprise. All of the Gulf nations have been eager for years to market themselves to the world as tourist destinations, as modern and dynamic places for investment; awarding one country in the region with the financial and media bonanza of the World Cup would inevitably incite competitive rivalry. As the UAE and Saudi Arabia have taken several serious blows to their PR image (the killing of Jamal Khashoggi, the escape and abduction of Princess Latifa, etc) the importance of the World Cup has only intensified. The blockade of Qatar has become extremely troublesome for all parties involved, and it has made it even more perilous for visitors to the region, as they risk being used as pawns in a political dispute that, apparently, has more to do with football than with politics. FIFA, knowingly or unknowingly, helped to cause this conflict, and FIFA should help to end it. Cancelling Qatar’s hosting in 2022 is not a viable option at this point; it would be too costly to too many interested parties, and giving the event to another host at this late stage is untenable. FIFA should expand the World Cup, and let Qatar’s neighbours share the event for the sake of regional stability. 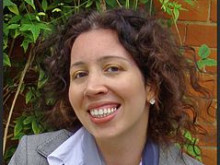 Radha Stirling, founder and CEO of legal and human rights organisation Detained in Dubai, Expert Witness and respected analyst of Middle East Policy. Ms Stirling has been a prominent advocate for human rights and judicial change and has represented numerous individuals, who have faced injustices.